Here's my card for the current sketch at Match this Sketch. I used Avery Elle's new Cool Beans set for my love themed design. 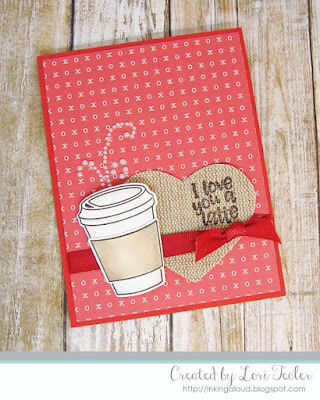 The set's to go cup image was paired with a burlap heart from my stash of stuff. The set's "I love you a latte" sentiment was stamped on the heart in black ink. I used my MISTI to stamp so that I could easily double (and triple) stamp the text so it would show up on the textured piece. I auditioned a few different patterned paper panels before settling on the XOXO patterned panel that the heart, to go cup, and red satin ribbon were finally arranged on. The third element in the sketch was represented with the pearl flourish "steam" extending out from the cup. The finished panel was adhered to a coordinating red card base.